As we are using PC and Smartphone in day to day to routine. These devices makes our life simple and easy. We access internet on these devices and access useful services to get information and entertainment. Many websites, apps, games are available for our devices. Smartphone apps are increasing rapidly after Android OS came into market. Android is an open source OS for mobile devices so it attracts developers. Millions of different apps are available in Play Store. We already listed out some best android apps and for games lovers also listed out best android games. Even Many apps are available which help to find many useful information. Basic purpose of mobile is calling so we their are some apps which helps to enhance the calling feature. Like we all want to know who is calling from unknown mobile number. There are many websites available on internet to get this information. But for smartphone Truecaller is one the popular app to trace a mobile user location and name. Truecaller has global phone number directory. You can easily trace the number when you get call from unknown number. But Truecaller totally destroy your phone number privacy. If you call to unknown person by mistake or dialed any wrong number then it will become serious issue. So to secure mobile number details we need to remove it. Our main motive is to secure and maintain our number privacy. 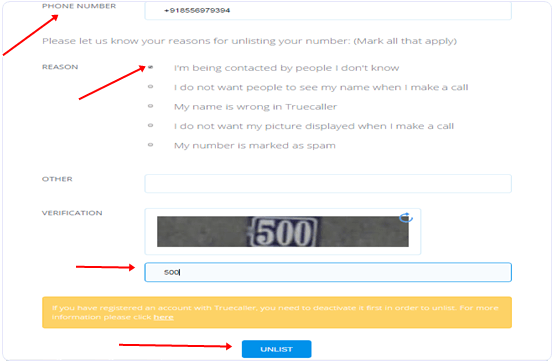 If you want to know how to remove your number from Truecaller then read this article because today we are going to discuss the method to remove number from Truecaller database. How To Remove Number From Truecaller. ? Step 1. Open your Web browser and type the following URL without Quotes and press Enter. Step 2. 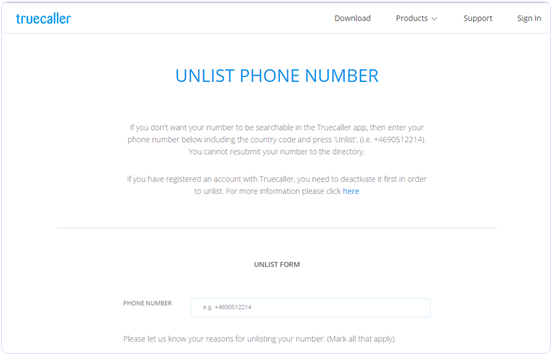 Now you see the Truecaller Unlist Phone Number Webpage. Scroll the page down. Step 3. In this Page you have to select some options like reason, verification captcha and verification code and enter your Phone Number etc. Step 4. After filling the form you have to click on the blue unlist Button After that your number is successfully removed from Truecaller database. Note:- Before Removing your number You have to deactivate your Truecaller account so that Truecaller verify that your the actual owner the number. Watch YouTube Video To Remove Number From Truecaller. In conclusion, we hope you like this method and successfully removed number from Truecaller app. Don’t forget to share it with others.